Without any doubt this is the top pick if you need 300W grow light. It's durable, the light is very bright we bet that your plants will fall in love with this one. 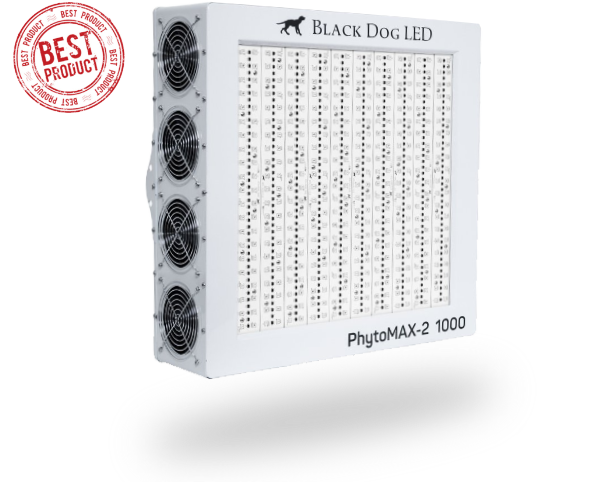 The best light in its category, this 600W light has everything you need in a grow light. It uses high-quality LED chips and has a timer that allows you to automatically switch the light on and off. Truth be told, a 1000-watt LED grow light doesn’t get better than this! The intense, even light it produces will cause your plants to grow faster and have a better yield. This light takes the top spot thanks to its excellent construction, low power consumption, and high power output. You’ll be hard pressed to find a more powerful light for the price. When shopping for a LED grow light, it's very easy to get confused by the endless choices on the market. That’s why we’ve decided to do the math to ensure you get the best grow light for your budget. 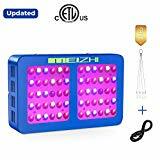 If your budget for a grow light is $100, get the MEIZHI 300W Full Spectrum Grow Light as it has the least price per watt. 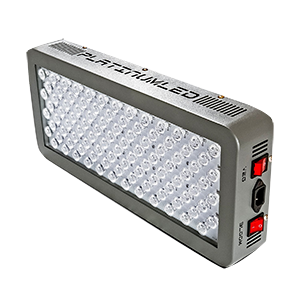 It has superb features like a 120° reflector panel, high PAR, and dual switches that allow you to control the light output. 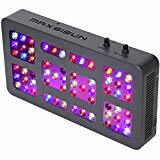 Other great lights for a $100 budget are the MAXSISUN Dimmable 300W Full Spectrum Grow Light and VIPARSPECTRA’s Dimmable 350W LED Grow Light. 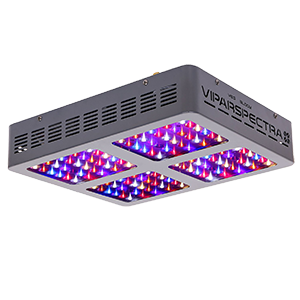 The VIPARSPECTRA DS300 Grow Light is also very efficient, but it has the highest price per watt. If your budget is $200 or $150, the best light in this category is DIMGOGO’s 1200W Full Spectrum Light. 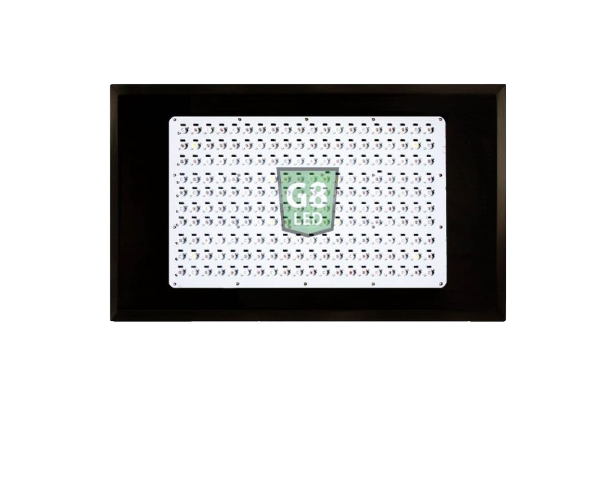 Each of its LEDs has 5-watt double chips and produces bright, uniform light. 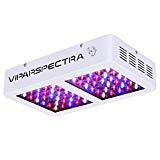 Its spectrum consists of ultraviolet light, infrared light, and all the lights needed to boost plant growth and yield. 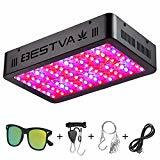 Another great light for this price range is BESTVA’s 1000W LED Grow Light. While its price per watt is higher, it has a wider coverage than the 1200W LED light. 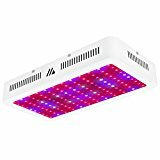 We've done our best to showcase the best LED grow lights in different categories to save your precious time and to focus on growing your plants or buds, however if you want to make your own research and to choose LED grow light on your own we strongly suggest to consider following factors while choosing led grow light. You may not know it, but the quality of your LED grow lights will determine the yield your plants produce. A light made using high-quality materials can last up to 10 years.A good LED grow light has high-quality semiconductor chips, metal housing (typically aluminum), and good wiring. Faulty wiring can generate excess heat which may damage your plants – or become a fire hazard.Aluminum is an excellent conductor of heat and helps move additional heat discharged by LEDs. If a unit has plastic casing, don’t buy it. A top-notch LED grow light has a constantcurrent driver and not a constant voltage driver. As LEDs become warm, their voltage drops. A constant current driver ensures the current remains steady as the voltage changes due to increasing temperature. This prolongs the life of the diodes. When it comes to LED grow lights, the brand makes all the difference. Don't make the mistake of buying a "no name" light on an e-commerce site as it will get spoilt very fast. While there are numerous LED brands on the market, not all offer high-quality products. Good LED grow light brands (manufacturers) have made many growers happy and boast excellent reviews by customers. They are reputable and can always be trusted to provide quality products. 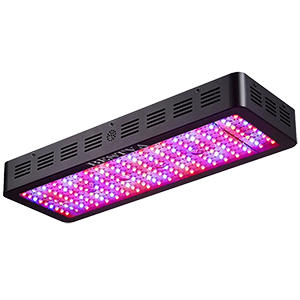 Many well-built LED grow lights are designed in the United States and manufactured in China. They are made according to the specifications of the American company. 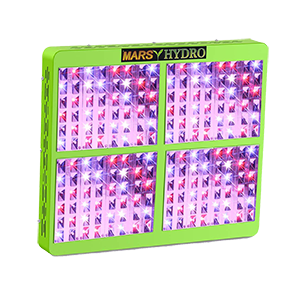 Some high-quality grow lights are designed and manufactured in china by well-known brands (like Mars Hydro) and are just as good as AmericanLED grow lights. Some plants need full sunlight (like flowering plants), others thrive in low-light conditions (like succulents), while others need bright and dull light at different stages of growth (like vegetables and Marijuana). Dimmable LED lights allow you to increase and decrease the light output without altering the height of the light. 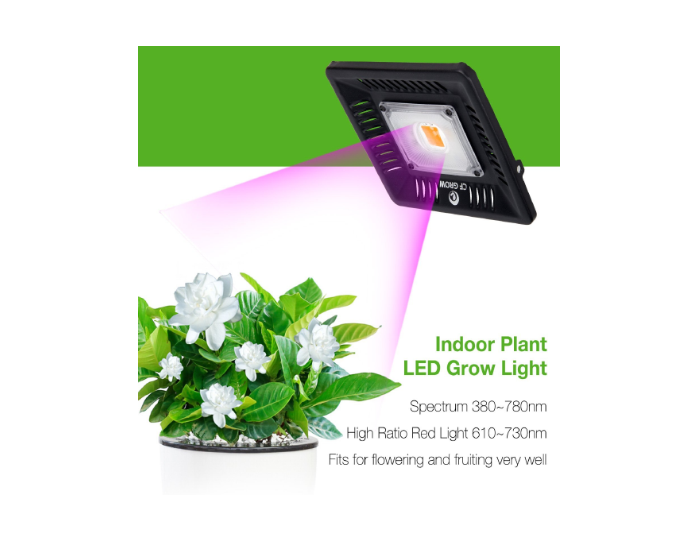 The light you buy must be ideal for the plants you plan to grow. 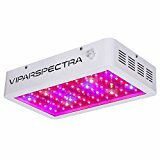 While all LED grow lights will illuminate plants to some extent, some models are designed to address specific plant needs and have different wavelengths for different growth stages.Most LED grow lights have a full spectrum and can be used for an entire grow cycle – from seedling to harvest. The growing area you want to cover should dictate the grow light you buy. 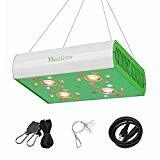 A large 600-watt light can cover approximately 12 square feet while a small 100-watt light can cover less than 4 square feet. If you plan to expand your growing area in the near future, consider getting a large dimmable light because you can dial down the light intensity. 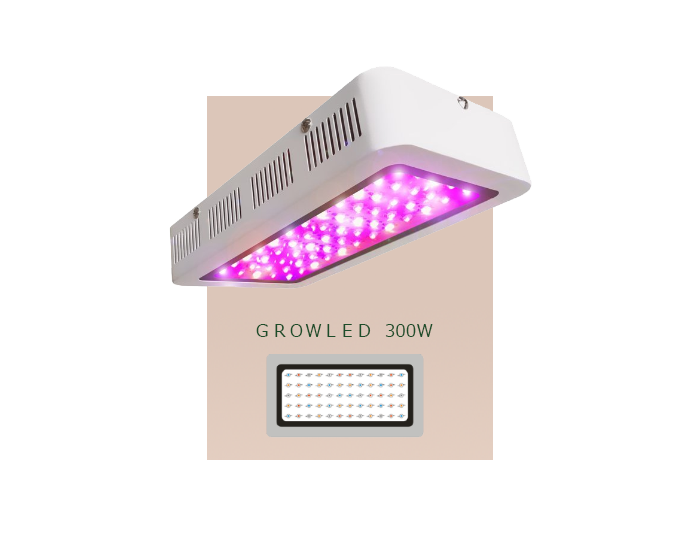 ALED grow light should illuminate the specific space you want it to illuminate. Generally,one square foot of growing space needs about 32 watts of power. And this does not mean LED wattage but the actual watts the light draws. Many research studies done on indoor plants suggest that 3 watts is the ideal wattage for a LED chip. 3-watt chips perfectly balance cost, size, and heat generation. While 1-watt chips produce the lowest amount of heat and are the most durable, they do not contain the power needed to pierce into the plant canopy. 5-watt, 10-watt, and other higher-wattage chips are very intense, but they are the least efficient and don't have a long lifespan like 1-watt chips. 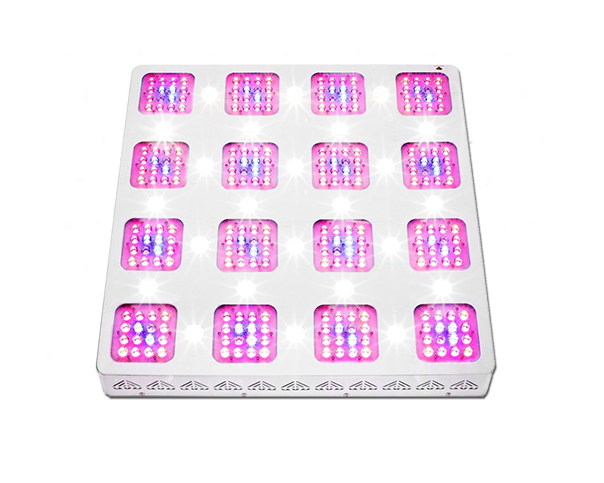 LED grow lights with low-wattage chips need more chips to produce intense light while those with high-wattage chips need fewer chips. Plants usually convert light energy into energy they can use through photosynthesis. And for photosynthesis to be efficient, plants must be exposed to different wavelengths of light. The best LED grow lights provide plants with the spectrum needed during every growth phase. 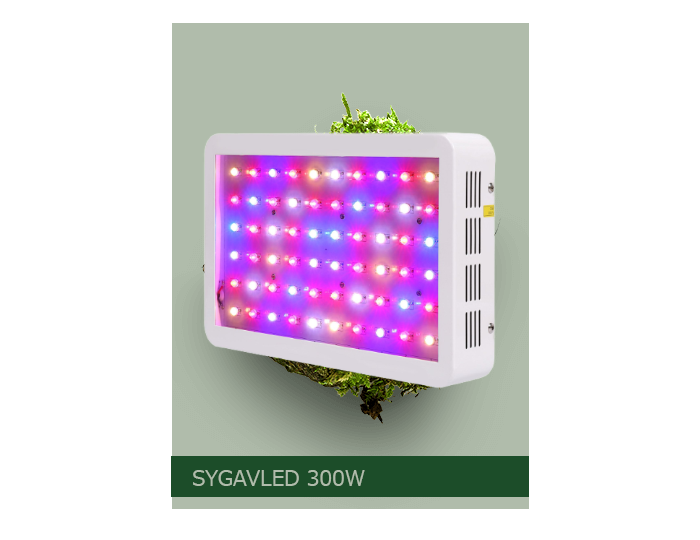 Blue light (440nm-470nm)mimics the summer sun and stimulates vegetative leaf growth while red light (640nm-660nm) replicates the autumn sun and encourages flowering. Ultraviolet light (315nm-400nm) activates a plant's defense mechanisms and influences plant development and metabolism. Infrared light helps boost plant growth. A good LED grow light has all these colors as well as white,red, and green lights. The advertised LED output wattage usually varies from the actual LED output wattage by up to 75%. A manufacturer may say that they use 3-watt chips in their grow lights. But the diodes never operate at full capacity and usually run between 500mA and 700mA. Most LEDs run at 550mA to enhance the lifetime of the diodes. This means that a 3-watt chip may only pull 1.7 watts, based on the wavelength. When comparing a LED grow light to a metal halide (MH) or a high pressure sodium (HPS) light, use the true LED output wattage. To obtain the same amount of PAR from a LED grow light as you would from a HPS or MH light, use between 50-75% less wattage. For instance, if a panel uses 300 3-watt chips, it doesn't emit 900 watts of power. Rather, it emits about 500 to 600 watts of power. Always use the real wattage to determine the power output. Good companies make good LED grow lights, you always get what you pay for. Since LED lights can be a costly investment, look for those made by companies that give lengthy warranties (3 years and above). The likelihood is they use materials of the highest quality to make their grow lights. Some manufacturers even offer a 5-year warranty. The return policy is also worth considering. Some manufacturers have a no return policy while others give a 30-day or a 90-day money-back guarantee.